Easy to prepare, tasty to consume - this salad is an amazing blend of creamy and crunchy, savoury flavours with hints of sweetness. Toss kale with vinegar in large bowl; let stand 15 min. to soften slightly. 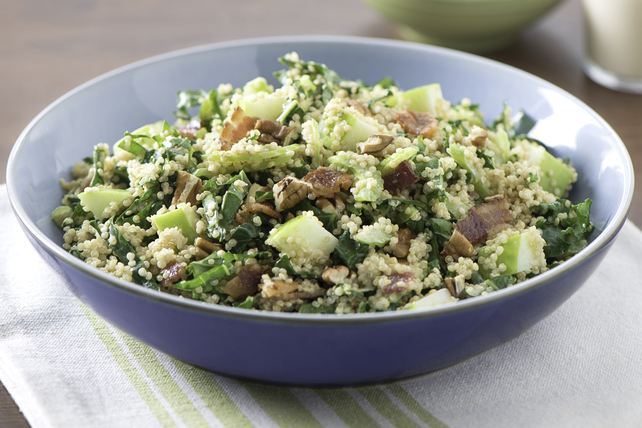 Add quinoa, bacon, apple and celery to kale mixture; mix lightly. Mix dressing and apple juice until blended. Add to salad; toss until evenly coated. Substitute walnuts or almonds for the pecans.